In late August, we launched our Whole30 meal planner with Real Plans. 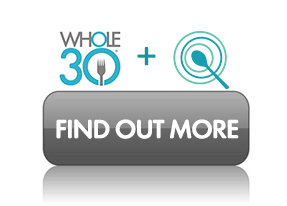 Over the past four months, the Whole30 community response has been overwhelmingly positive. Like, even we were surprised at how much YOU LOVE REAL PLANS, even though we totally know how incredible their program is. For many, the planner was exactly the tool they needed to succeed with the Whole30—without feeling enslaved to the kitchen. Here, we’re sharing stories of two happy Whole30 newbies who found the confidence to tackle our program with their meal plan from Real Plans. 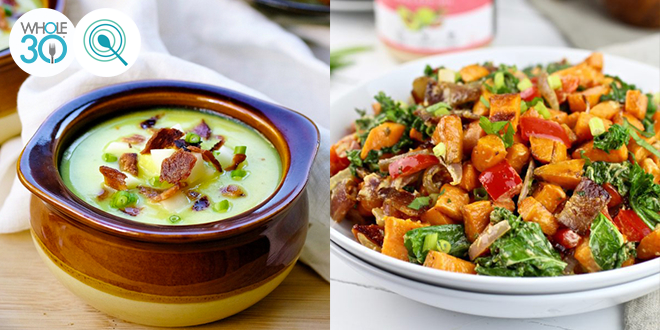 A tale of two successful Real Plans #Whole30 meal planners: the foodie and the family. “While on vacation in Colorado, I met a girl who introduced me to Whole30. When I returned home I spent hours on the Whole30 website getting myself familiar with the dos and don’ts of the program. This is where I discovered the Real Plans Whole30 planner. Being a planner as well as a lover of food, it was a no-brainer. Without any hesitation, I purchased a year subscription because I saw the long term benefit in Real Plans. It would help me plan healthy meals and open me up to different ways of food prep. Without the Real Plans Whole30 planner, I would not have made it through 30 days of Whole30 eating. It would have been too easy to slip and unknowingly eat something that was non-compliant, which would resulting in having to start my Whole30 program all over again from Day One. But with the planner, I was able to extend my Whole30 to a Whole40! I love the flexibility of customizing my weekly menu based on my needs and more importantly, my tastes. No one dictates my weekly menu, and there is no limitation to the variety offered, even while sticking to the guidelines of the Whole30. There is such a variety of flavors represented; there is something for the simplest eater to a more experienced pallet. 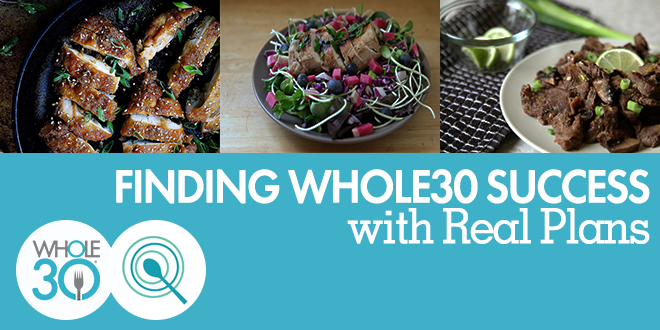 Real Plans takes all the guess work out of meal planning when doing Whole30. Also, I feed my boyfriend 4-5 times a week, and even though he did not do a Whole30 with me, he sure wasn’t complaining about the the amazingly delicious food I was plating. I know from past experience that I do better if I have a menu. After reading the Whole30 books for a few weeks and getting our brains and our kitchen ready, we decided to see if a meal plan existed. I went to the Whole30 website, saw the ‘meal plans’ tab at the top and read about Real Plans. I knew this would help us, so we initially joined for a one-month subscription. I have a family of four: myself, my husband and my two grown boys (23 and 20). My 23-year-old is out of the house quite a bit so he eats Whole30 meals anytime he eats with us. The rest of us committed to a 100% by-the-book Whole30. Our lives are extremely busy, so, I’ve made a routine of organizing our Whole30 meal plan in the Real Plans planner on Saturday mornings. I customize our list for the following week, check my shopping list for items I might already have in my kitchen and head out to shop. On Sundays we prep our food for the week so that when I get home on weekday evenings we only have about 35 to 45 minutes of prep/cook time before dinner is ready. This is an amazing tool! Three weeks into our Whole30, we knew this was something we had to have in our lives permanently. We reached out to Real Plans customer service and requested to be changed to the quarterly subscription. I love that I can import my own favorite recipes. I also love how phone app breaks each recipe into step-by-step instructions. I’m seasoned in the kitchen, but my hubby and sons are not. Having the instructions broken down into steps helps them to feel more confident. We agree with Angela, Kerry, and the other Whole30’ers who have written in with their rave reviews… the Real Plans Whole30 planner is truly magical. In minutes, it customizes a month’s worth of Whole30 meals based on your tastes, preferences and schedule. It also generates a detailed shopping list to organize your grocery runs. You can print your favorite recipes and access your account on their mobile app to plan your meals on the fly. Melissa Hartwig worked behind-the-scenes with the Real Plans team to create Whole30-specific features, like a personalized meal plan to help you through the Fast Track Reintroduction period. Yes, that’s right: the Whole30 planner will actually help you reintroduce non-compliant foods one at a time, according to our official recommendations. And, our Whole30 team regularly adds new recipes from your favorite Whole30 recipe creatives to the planner, offering you variety through your first Whole30 and beyond. 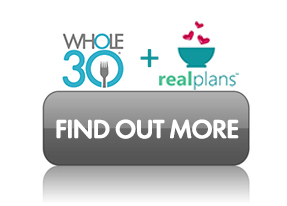 Ready to find out if the Real Plans Whole30 planner is for you? Watch Melissa’s Facebook Live video tutorial, or click the button below to learn more. Header images by ChihYu of I Heart Umami and Sarah Steffens.